In this article we provide details on where Space Mountain is located and display some of the Space Mountain Maps for the ride at Walt Disney World Florida. Where is Space Mountain located and which park is space mountain located in? Space Mountain at Walt Disney World Resort is located inside of the Magic Kingdom theme park in Orlando, Florida or more precisely Bay Lake, Florida. The ride is located in the Tomorrowland section of the theme park, which is on the east side of the Magic Kingdom. This is the location of Space Mountain in Walt Disney World Florida. Disney has different versions of the Space Mountain roller coaster at their other parks, however, the Florida version was the first one created. Disneyland California, Hong Kong Disneyland, Tokyo Disneyland, and Disneyland Paris have versions of the attraction at their theme parks. Walt Disney World has created several maps for the Magic Kingdom park. 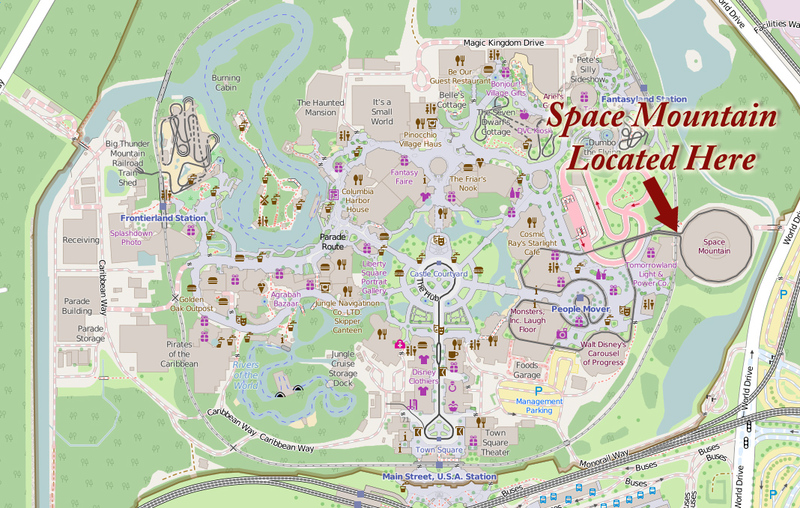 On the Magic Kingdom map, Space Mountain can be located by looking on the right side of the map. 1. Interactive Map: https://disneyworld.disney.go.com/magic-kingdom/maps/ - this is the interactive map created by Disney that can be accessed by going to that URL. Space Mountain is on the right in Tomorrowland. The PDF map is a portable document format file that can be downloaded and saved to your device. You can open it with Adobe Acrobat or any PDF viewer. The current one was located at the first link, however it could change. Disney links to the PDF map on the second link/page, which is the home page for the Magic Kingdom. The link on the page is called "Download Printable Map". This page should always have the updated version of the Space Mountain map. The mobile apps for Android and the iPhone have full interactive maps with wait times for Space Mountain. Above map from OpenStreetMap Contributers, modfied by NavFile. See below for interactive version. Other sites, compaines and persons have created their own maps of the theme park that shows the location of Space Mountain on their maps. Below are a few of the best maps. Also if you are looking of a map of the inside / ride layout of Space Mountain, we have not found one that is detailed enough for posting. We will update this page with more options for maps when we locate them.